Data. The more the merrier, right? The ‘big data’ hype has everyone talking about the volume, velocity, and variety of data – and for good reason. The benefits of using data to solve organization and societal problems have been far reaching, the extent of which remains to be seen. But blindly collecting, purchasing, or retaining data for the sake of ‘big data’ can lead to a host of problems. One particular problem that has yet to accompany the mainstream buzz of big data is inaccurate data, and the downstream issues that can arise from it. Two of my colleagues and I decided to research and investigate just how much we should be blindly trusting and thereby relying on data. 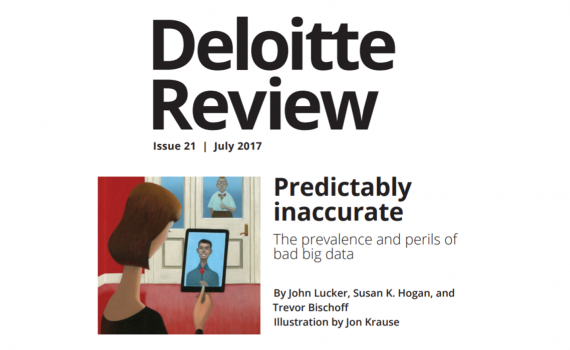 From that research, we wrote an article which was ultimately published in Deloitte Review. Click here to read Predictably Inaccurate. Our results might surprise you. Hear me talk about the article on Deloitte Insight’s podcast about here.